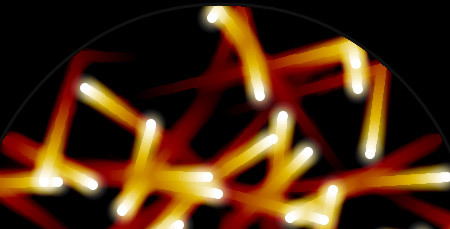 Here is some more HTML5 canvas particle fun for you. I modify my earlier particles bouncing off a circular wall example to create colorful, fiery trails behind the particles. The effect is achieved by a simple manipulation of pixel values over time. Click here or on the screenshot below to see the effect, then read below to learn more about the code. The basic particle code here is exactly the same as my previous example, so I will only comment on the fire trail effect. The idea behind the fading trails is simple: when it is time to draw the particles in their new positions after a screen refresh, we do not erase the previous picture but instead fade it out and draw on top of it. This fading trail technique is similar to that used in an earlier post, where the trails were caused by alpha fading (also see that post for a discussion of browser differences in handling alpha values). Here we fade out the previous picture by simply subtracting fixed amounts from the red, green, and blue channels. The colorful effect is achieved by fading these color components at different rates: red fades the slowest, blue fades the fastest. Since the particles start out colored white, when their images fade the colors transition from white to yellow to orange to red. If you experiment with these fading amounts, you can achieve differently colored trails. An alternate approach would be to multiply the color components by numbers less than one, which will also create a fading effect. But multiplication is slower than subtraction, and in my testing I have found that some browsers slow down considerably when the multiplication method is used. //image fade - NOT OPTIMIZED! Here is what is happening in this code. First, we retrieve the current canvas image and its pixel data. Then in a loop we modify the red, green, and blue channels of this data by subtracting the fixed fade amounts. (Note that in groups of four, the red, green, blue, and alpha values for each pixel are stored in sequential order in the pixel data array.) We are careful to clamp these values to non-negative numbers before setting the new values. After the pixel data has all been modified, we use the putImageData() method to draw the modifed image back into the canvas. A lot of calculations are being done on each refresh of the screen, but in my testing the effect runs rather smoothly, with some variance between browsers. Smaller canvases will certainly run faster. Have fun and try some different colors! Drawing a semi-transparent rectangle over the whole display is a good option and much faster than adjusting each pixel like I’m doing here. However, it can be a little problematic, depending on the browser – faint traces of the trails can be left behind. See here: http://rectangleworld.com/blog/archives/871. But in the “fire trail” example in this post, I was doing a specific kind of fade which produces a white-to-yellow-to-red fade, which can’t be done by copying a constant color over the display. I don’t really know how practical this example is…it was mainly just for fun.